And how about a Hip Hip Hooray! Life can’t get much better! I’ve been trying to polish a particular picture book manuscript…it’s about a boy who wants to be a cowboy…and it’s in rhyme. Complicated rhyme. Which is hard to do. I’m so reluctant to change it up – into prose or free verse – because, as you know if you are a writer, it’s difficult to ‘kill our darlings’… that is, get rid of something we love or have gotten attached to. And then I found this book in a library discard pile – a totally fun romp of simple rhyme and active verbs and awesome illustrations – all about a little cowpoke who joins a cattle drive. So I will be rethinking my own manuscript – and offering this charming picture book as an example of the top ten element of rhyme. Boots and vests and leather chaps. 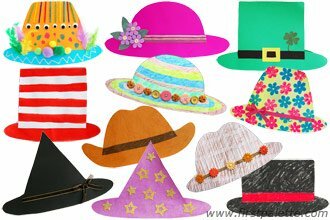 From Amazon: “They don their boots and hats and chaps, down their flapjacks, then it’s up into the saddle and off they go. through the chaparral and sage on their ponies, roping strays. Very few words – but each one counts!
. Lots of great picture book stuff in the air. 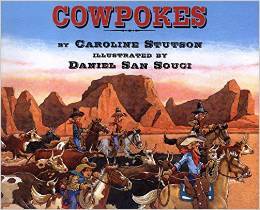 This entry was posted in Christie Wild's PB 14:14, crafting, Susanna Hill's Perfect Picture Book Friday, Top Ten Elements in Picture Books and tagged Caroline Stutson, Cowboys, Daniel San Souci, Make a cowboy hat craft, picture book review, Rhyme in Picture Books by viviankirkfield. Bookmark the permalink. Great review and example of rhyme! Love cowboy books, and this one is now on my find and read list. Thanks Vivian for your post. I wish I could write rhyme, because I love to read it. Too bad this one ended up in the discards! I can imagine a classroom of children listening to Cowpokes while wearing their cowboy hats. Sounds like quite the serendipitous find! Cowboys are so much fun for kids. This sounds like a great find for you. I love all the additional ideas you provide for how to use this story! Thank you so much, Joyce! Every Friday I participate with picture book author Susanna Leonard and a bunch of other picture book lovers…we post a picture book review with activities or resources…and link up on Susanna’s blog…I’ve been doing it for a couple of years and it’s great fun! Cowboys never grow old, right?! The rhyme sounds spot on. I love how you combined the last day of PB14:14 with Perfect Picture Book Friday. The activities you listed are a great combo for this book which seems like a fun rhyming book for boys (and girls). Often when I read a picture book I immediately think of ways expand on it with discussion, crafts, mini fact quizes, songs, etc. It’s been so long since I’ve been in the classroom, but I guess once a teacher, always a teacher. Keep working on your book, because I know first hand that you are an awesome writer. Awww shucks, Linda. 😉 😉 Thanks for the kind words. Kids will always love a cowboy story. This one sounds wonderful. Great activities! Sounds like my kind of book! I love rhyming, I love cowboys/cowgirls, and I love horses! You might find one in a library, Heather…or a used bookstore. 😉 It’s a treasure for sure! And the illustration are lots of fun! I’ve found some real gems in the library discard pile and library books sales. Cowpokes looks like a lot of fun! Good luck editing your manuscript! I know that libraries can’t keep all the books…there are new ones coming in all the time…but I’m always happy when I can rescue some of the discarded ones. I love your cowboy story! I love the one you wrote about too, but did you notice there are some near rhymes? So rules are meant to be broken, aren’t they?